Guide to various citation styles, including tips for citation analysis and writing. The synthesis of the compound has been described previously (1). The synthesis of the compound has been described previously (Johnson, 1902). With numerical citations, references should be numbered sequentially. If a reference is repeated, do not give it another number; rather, use the original reference number. With author name citations, use both names if a reference has two authors (Jones and Smith, 2002). If there are more than two authors, use the first name followed by et al. (Harris et al., 2001). Arrange the references in your bibliography based on the method used for in-text citations. If numerical citations were used, then arrange references at the end of the paper numerically. If author names were used, arrange alphabetically. All references end with a period. Do not leave blank lines between references. Journal article titles and book chapter titles are not essential, but they are considered desirable. If a book as a whole is used, pagination is not necessary. 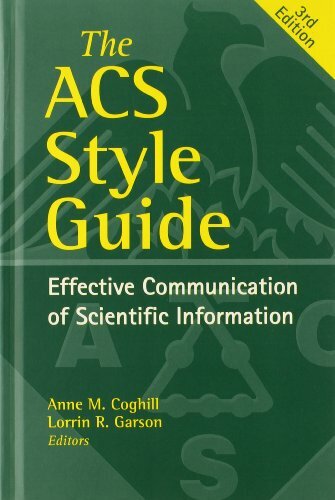 Online access to the ACS Style Guide is available via the ACS website. Chapter 14 contains the rules for how to cite references in text and create a bibliography. Some examples are provided below. The minimum required information for a book is author or editor, book title, publisher, city of publication, and year of publication. Omit words like “Company,” “Inc.,” “Publisher,” and “Press” in publishers’ names. Some ACS publications include the chapter title in book references, while others do not. Check with the publication itself. Using the word “In” signifies the primary author(s) wrote only part of the book, not the entire book. Anastas, P. T.; Warner, J. C. Green Chemistry: Theory and Practice; Oxford University Press: Oxford, 1998. Asmus, K. D. Recent Aspects of Thiyl and Perthiyl Free Radical Chemistry. In Active Oxygens, Lipid Peroxides, and Antioxidants; Yagi K., Ed. ; Japan Scientific Societies: Tokyo; CRC: Boca Raton, FL, 1993; pp 57-67. This citation, below, is in ACS format. The journal shown in this example has a volume number but not an issue number. If there is an issue number, it is found after the volume number, but before the page number(s). Note: Journal abbreviation and volume are italicized. However, issue number (if present) is not italicized. Year of publication is bolded. Use CASSI (Chemical Abstracts Service Source Index) to find standard journal abbreviations. Here is an example, below, of an article with an issue number. Berthod, A.; Ruiz-Angel, M. J.; Carda-Broch, S. Ionic Liquids in Separation Techniques. J. Chromatogr., 2008, 1184 (1-2), 6-18.